Welcome to language-easy.org! Well, as you have clicked on this article, I suppose that you are ready to enter the depths of German verbs – and learn everything about German separable and inseparable verbs. Although you might think that a simple type of German verbs can not be of such a high importance – They definitely are. Well, just imagine the bunch of German words that consist of prefixes and their stem. So, in most cases, they meaning changes, depending on which prefix you put there. And that’s why you should dominate this topic – in order to understand these variety of different verbs and, of course, how to build them by yourself. 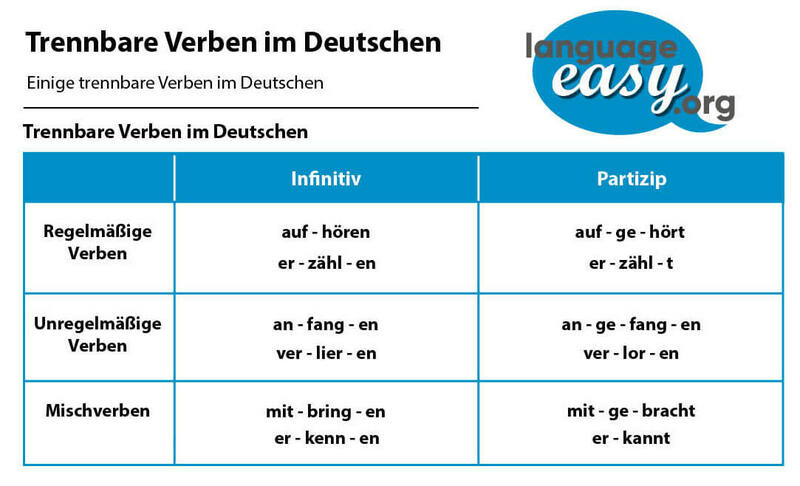 In the following, I’d like to give you a short idea of what German separable verbs and inseparable verbs actually are. After that, we will have a shot look at a list of some German separable verbs and inseparable verbs. Finally, there is a third group: Verbs that are both. By the way, in case you’d like to have some background information about this topic – just have a look at this article on Wikipedia. Hopefully, it will provide you with all the additional information you are looking for. And now, let’s not lose too much time and go straight to the first topic of this article: A short list of German separable verbs. Auf geht’s! What are German Separable and Inseparable Verbs? Was sind trennbare und untrennbare Verben im Deutschen? So, first of all, let’s clear up what German separable and inseparable verbs actually are. Well, try to keep in mind the following description. German separable and inseparable verbs are verbs whose meaning is altered by the addition of a prefix. Of course, these prefixes are are separated from their verb in the conjugated forms. Whereas, inseparable prefixes cannot be separated from their verb. So, the prefix determines whether a verb is separable or not. Well, as already mentioned, whether a verb is separable or inseparable depends on its prefix. So, in the following I’d like to present to you a short list of prefixes that make verbs separable. Of course, there are also some rules that come with German separable verbs. Well, as the short list of prefixes of separable verbs, please try to keep the following rules in mind, too. First, in the finite form, these verbs are separated from their prefix, which usually comes at the end of the sentence. Second, in the past participle, we add “ge-” between the prefix and the verb. So, let’s come to the next point of this article about German separable verbs, a short list of inseparable verbs. So, in this part of this article I’d like to talk about the German inseparable verbs. Well, as in the part before, I’d like to show you the prefixes that make a verb inseparable. Of course, it is very important that you keep these prefixes in mind. Luckily, there are also some rules in the context of German inseparable verbs. Well, you will see that it can be really useful to remember the following rules. First, some verbs with these prefixes are always separable. Some other verbs with these prefixes are never separable. Some verbs with these prefixes can be either separable or inseparable. In this case, the separable verb and the inseparable verb have two different meanings. By the way, we stress the prefix in separable verbs and the syllable after the prefix in inseparable verbs.